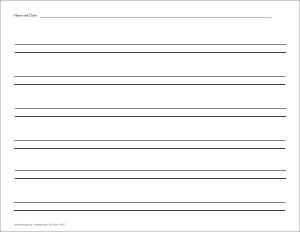 Double Line Printable Paper features a rule that has two lines instead of three. 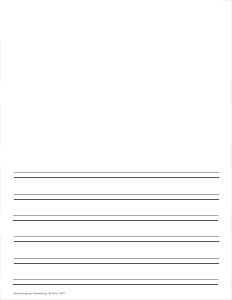 Papers come in 3 rule sizes, in landscape and portrait, fully ruled, blank top, with 4 columns, and booklet. 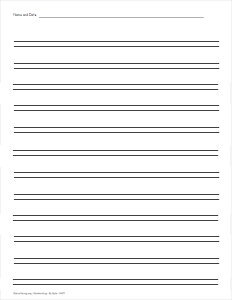 Rule height usually refers to the height of all thee lines but this paper has two lines, so I will list what might be the height of the 3rd rule and I will list the paper as for a certain school grade. Groups of files marked as "BW" will have black lines. Groups of files marked as "GS" will have gray lines with the bottom line being darker than the top line. Each rule height is available in both fully ruled and blank top. Additionally, the blank top might have two files, one being around half-ruled and the other being around one quarter ruled. I will list the number of ruled lines with the file link. 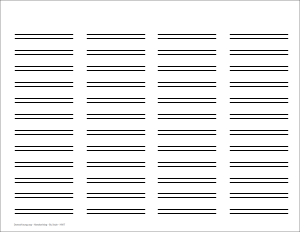 The larger number of ruled lines means there is less blank space. 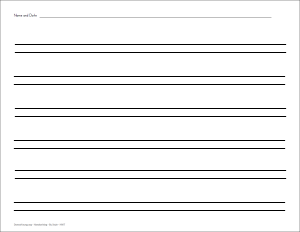 Unless I enter Header with a blank top file, blank top papers have no header. To Claify: Blank top files that do not have header information with the link will have no header. The files in this group feature 4 columns of ruled lines. Bowl Paper (and Oval Paper, not pictured) have no top rule line.